If you look at Kelsey Wells’ Instagram feed today, you’ll see a stunning, body-confident woman with an insanely ripped six-pack and perfectly toned arms, glutes, and legs. But just like the rest of us on a fitness or weight loss journey, Wells had her ups and downs, frustrations, and struggles with what she was seeing on the scale. After giving birth to her first child, Wells weighed 145lbs and decided that she would set her goal weight at 122lbs so that she would be able to “fit into my skinniest jeans”. The only problem? She wasn’t happy with the results she was seeing in the mirror, despite hitting her goal weight. Then one day she started ignoring the number on the scale altogether—and gained 18lbs of pure muscle tone. 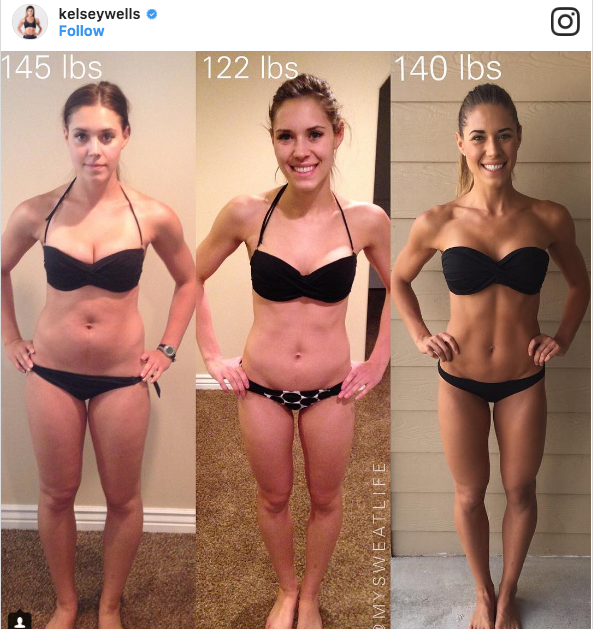 Nowadays, Wells continues to share her contagious body positivity and quick-hit workout routines on her Instagram account (which has almost 1 million followers)—and always reminds her readers to “SCREW THE SCALE”.